A Mom on a Bike: To ride or not to ride? I have been meaning to write about this for some time but needed a nudge in the right direction. That nudge came from Mr. Brown of Ione, CA in the form of a letter to the editor at the Sacramento Bee. 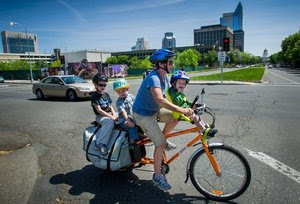 For those of you who don’t know, I was photographed riding around downtown Sacramento with three of my four boys on the bike. To Mr. Brown’s credit the original picture was published in black and white and I have had a number of people confess that it looked like I just threw kids all over the bike. I, unfortunately, only have access to the color picture which looks much better. I found the picture of Kate Burns and her three sons on her bicycle quite disturbing. I did not see an excellent advertisement for "May is Bike Month." Instead, we saw a woman who was violating Ca. Vehicle Code 21204 and endangering her small children. I hope she discontinues this practice immediately. I would like to respond to Mr. Brown’s letter regarding the picture of me and my three sons posted in the Bee on May 2nd. The black and white picture posted in the Bee did not do this bicycle justice and I understand the confusion and concern. To clarify, I would like to address this letter specifically and generally. a) A person operating a bicycle upon a highway shall not ride other than upon or astride a permanent and regular seat attached thereto, unless the bicycle was designed by the manufacturer to be ridden without a seat. (b) An operator shall not allow a person riding as a passenger, and a person shall not ride as a passenger, on a bicycle upon a highway other than upon or astride a separate seat attached there to. If the passenger is four years of age or younger, or weighs 40 pounds or less, the seat shall have adequate provision for retaining the passenger in place and for protecting the passenger from the moving parts of the bicycle. Glossing over the fact that I was not on a highway but riding in downtown where there are lights every block; the bike is made to operate as I am using it. All the passengers under 4 are restrained in place - the child on the front has a belted bike seat and the first child on the rear has stoker bars, foot pegs, and a healthy dose of common sense. The back seats - and they are seats - are firmly attached and protected from the wheels and gears twice - once with bags and once with wheel skirts. Many people assume that biking is dangerous – you will die. “Is it safe?” is a question I hear frequently and most don’t seem to believe my answer. Webster’s defines the word safe as being secure from harm, injury, or danger. Safe does not exist in the real world - everything we do involves risk. I am reminded of this every time I fall down the stairs, slip on my tile floor, buckle my kids in their car-seats, or book an airline ticket. Indeed, even sitting on our backsides doing nothing carries risk – the risk of diabetes, heart disease, high blood pressure, and too-tight pants. Of course biking carries risk but is it dangerous? In 2009, according to the U.S. Department of Transportation National Highway Traffic Safety Administration, 630 pedal-cyclists died and 51,000 were injured in traffic accidents. Those numbers account for 2% of all traffic related fatalities and injuries in 2009. These numbers imply that the other approximately 86% (pedestrians accounted for 12% of traffic fatalities and 3% of injuries) of people injured or killed in traffic accidents in 2009 were driving or riding in cars. Obviously, being in a car does not ensure safety. In fact, based on these statistics, one could argue that riding a bicycle is safer and less dangerous than driving and definitely less risky than walking. Additionally, there are ways to minimize the risks of bike riding – riding with traffic, obeying traffic signs, wearing helmets, signaling, using bike lanes/ trails when available, and wearing lights and reflective gear at night. Although I take care to minimize the risks as much as possible, I realize that I am also depending on motorists to be considerate, law abiding, and in control of their vehicles. When I ride with my kids I am teaching them how to bike safely - they are learning traffic laws and experiencing how important it is to “share the road”. Lessons I hope will make them not only better (future) drivers but better people. I weighed the risks and the benefits and decided to ride with my kids. I have found that riding my bicycle is invigorating, relaxing, economical, and enjoyable - even with the kids on back. I can’t very often say that about my car trips. I think we will continue this practice indefinitely. I feel very strongly about the general safety part of my letter. I cherish my kids and would never put them in a situation where I thought they would absolutely get hurt. I spend a lot of my time on this bike off of main streets riding mainly on bike paths or through residential neighborhoods. 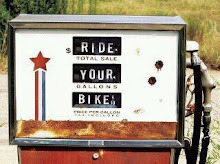 I’m not saying that everyone should ride that way, it’s just how I prefer to ride. Anyway, this hasn’t changed my mind a bit - I don’t feel judged or threatened. I feel like I need to ride more so people get used to seeing bikes and bikes with kids. Great response. I hope he reads it. We are in the NJ Shore and I can only imagine what kind of comments people will give us as the summer comes and more people come to our area. I agree with you, everything we do has some element of risk involved. That's just the way it goes. Excellent. You're much more calm than I! I should admit that it makes no sense for me to be so outraged because I have never been called out like this, online or in person. The only people that make comments to me say, "Nice bike," or give me a thumbs up as they go by. I hope that at least in person you will have such nice interactions. I don't understand why people get so bent out of shape about this stuff. I don't ride with my kids (yet? still too small, I think), but I imagine I will one day. For now, I just make sure they see me riding my bike, so that when the time comes, they will think nothing of it. You go girl! That guy only sounds like a tool. Super response, Kate, to educate the general public and support your choice. Way to go! I do hope your reply letter was published as well. As parents, we have different levels of comfort as to what "protecting" our children looks like. People don't get bent out of shape any time a parent drives a child somewhere in a car. I try to have a thick skin about others' criticisms of me bicycling with kids (not overly successful), but I do know that while I am imperfect, I love my kids fiercely and believe strongly that bicycling with them enhances their childhoods, our bonds as a family, makes us more engaged community members, and sets forth a good model of what non-car transportation can be. awww I think its way cool that you ride, around with your kids the way you do. Seems like no matter what anyone does there will always be someone who has something to say. I think you handled it very, well. Sorry to comment on an old post, but I came across this doing some research on the Boda Boda we just bought (downsizing from a Bakfiets as our son is now old enough to ride on the back). First, let me say that your letter is great and we're with you 100% - we bought our Bakfiets shortly after our son was born and he spent far more time in the bike than in cars his first few years (and still does). Anyway, I don't mean this at all to detract from your excellent letter, but since your prose strikes me as that of someone who who wants her positions to be clear and articulate (and probably someone has pointed this out already) I thought you would like to know that when CA vehicle code, and most state vehicle codes, refers to a "highway" it is referencing "any roadway open to public use." Thanks for sharing your experiences in your blog - the more people see how feasible it is bike with their families for more than just recreation, the better off we'll all be. Hello. My name is Kate..